At 22 years old, Deidre was using drugs, stealing and had already lost custody of her son. Then pregnant with her second child and struggling with depression, she turned to a family support program for help. “I have regrets and I sincerely miss my oldest son, who was adopted several years ago. I […] wish I could do it all over again and be the mother to him that I am to [my second son] now,” Deidre told Healthy Families Florida. Deidre’s oldest son is one of the nearly 428,000 children in foster care. According to the 2015 Adoption and Foster Care Analysis and Reporting System, 32 percent of these children came from a drug-abusing parent and 6 percent from an alcohol-abusing parent. Following a steady decline, the U.S. foster care system has seen a sudden spike in admissions, with five states — Florida, Georgia, Arizona, Indiana and Minnesota — accounting for two-thirds of the increase. Parental substance abuse is a driving factor in the influx of children into the system. When law officials across the country cracked down on careless prescribing practices in 2010, many people turned to heroin, which resulted in parents losing custody of their children. Florida’s foster care population saw a 24 percent increase in admissions from 2013 to 2015, compared with a national increase of 7 percent. Since 2010, the number of children placed in foster care because of their parents’ opioid use rose by 19 percent in Ohio, according to a coalition of children’s services agencies in the state. Similarly, Vermont saw a 40 percent increase in opioid-related foster care admissions from 2013 to 2016. West Virginia’s Department of Health & Human Resources reported a 24 percent increase in children admitted to foster care as a result of parental opioid use disorder from 2012 to 2016. Every year, Ohio’s child protection system allocates nearly $45 million to children who come into the foster care system from heroin- and opioid-abusing parents, according to the Public Children Services Association of Ohio. “We see a predominance of substance abuse cases in foster care. More than half of the families we see are involved with substance use or dependence in one way or another,” Amy Thomas, chief program officer of the Children’s Home Society of Florida, told DrugRehab.com. The consensus by law officials from several states is that substance abuse is responsible for the influx of children into the child welfare system in recent years. Alcohol and drug abuse by the parent was cited as the reason for removal in 32 percent of the cases of children entering foster care. Out of the 269,509 children who entered foster care in 2015, more than 62,000 will not return to their biological family because their parents’ rights will have been terminated. The increase in admissions and lack of foster families has forced the foster care system to rely on relatives to take in these children. According to a 2016 report by Generations United, more than one-third of foster care children who came from substance-using families in 2014 were placed with relatives. “The increase in heroin, meth, cocaine and prescription medication abuse, compounded by mental health issues, has brought many more children into our system,” James Wide of Indiana’s Department of Child Services said in an email to the Gainesville Sun. Heartbreaking images of parents unconscious from overdose in front of their children circulated on the internet in 2016, highlighting the impact of addiction. Addiction is a chronic and relapsing brain disease that takes over people’s lives. The inherent craving for the drug makes them slaves to their substance use disorder. Addiction doesn’t spare parents whose children need them. Parents may love their children and want to provide for them, but substance use disorders change the brain structure and lead to destructive behaviors. These behaviors have a ripple effect on children. About 12 percent of American children live with parents with a substance use disorder, according to the United States Children’s Bureau. Maternal drug use is one of the five key factors that may lead to a report of abuse or neglect to child protective services, according to a 2011 study published in the journal Child Abuse and Neglect. “The first type of exposure is prenatal exposure, where mothers are using drugs during their pregnancies. We see a lot of behavioral issues in children younger than the age of five due to prenatal exposure,” Thomas said. Substance use by expectant mothers has been linked to premature births, low birth weight, slowed growth and physical, emotional, behavioral and cognitive problems. Drugs and alcohol affect parents mentally and physically, rendering them unable to care for their children. Parents with substance use disorders struggle with controlling their emotions and sometimes lash out at their children. The disease compels them to spend their money on drugs and alcohol instead of food or other household items. In Ohio, seven out of 10 infants are in child protection services’ custody because of their parents’ opioid use disorder. Environments involving drugs and alcohol may cause an array of problems for children, including stress, depression, anxiety, PTSD, behavioral and learning problems, and attachment issues. Kimberly Pleasants from the Children’s Home Society of Florida told DrugRehab.com that foster children from drug-using families might have issues with spatial coordination and depth perception. She added that they often have trouble at school and show signs of learning difficulties. “Drug environments affect the children’s personalities. They look to their parents for a response, and when they don’t get a response, they tend to be agitated and act out,” Thomas said. Children from families where drug abuse is present typically have chaotic and unpredictable lives. When parents are under the influence of substances, their primary relationship is with drugs, not their children; they do not meet the basic needs of their children, resulting in neglect. According to an October 2014 report by the Children’s Bureau, substance-using families battle an array of problems, including mental illness, domestic abuse, unemployment and housing instability. These contribute to stress, which may spiral into domestic abuse against children. A child whose parents abuse alcohol has a different experience than a child whose parents abuse methamphetamine. Similarly, parents struggling with a prescription drug use disorder may exhibit different behaviors. The children’s safety also depends on the severity of their parents’ substance use disorder. However, even in homes where substance abuse does not contribute to the mistreatment of children, unstable households may drive children to using substances of abuse in their teenage years. According to the Center for Applied Research Solutions, self-medication with alcohol and other drugs is common among emotionally vulnerable teenagers. It can also lead to prolonged victimization, mental health problems, substance use disorders and self-neglect. 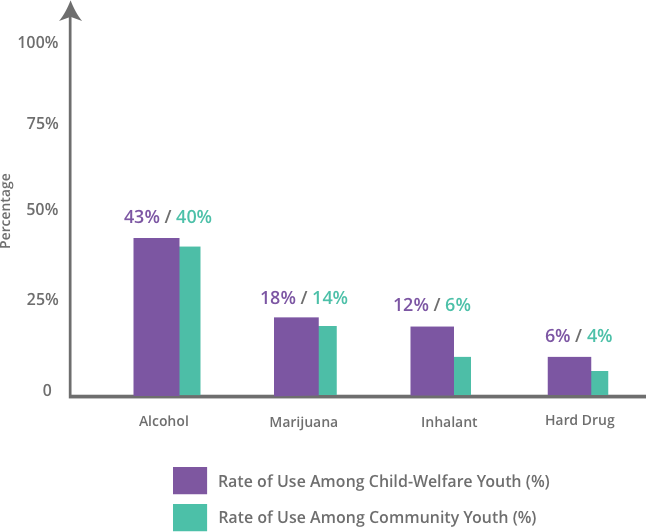 Parental substance abuse plays a significant role in the rates of substance use disorders among foster care children. Genetics and environment are two means by which these children find themselves caught in the web of addiction. The misuse of drugs and alcohol as a coping mechanism is another. Joel was six years old when the police removed him and his siblings from an abusive home and sent him to live with his aunt. When he was 15, following arguments with his aunt he would use drugs in his school’s bathroom to escape his troubles. He started with weed and progressed to speed and crack. When the situation got out of hand, his aunt contacted social services to have him placed in foster care. Joel admitted that although he felt his aunt was giving up on him, she saved him from a lifetime of drug use and crime. Many children in the foster care system grapple with substance use disorders. When parents abuse or neglect their children, welfare services often remove the children from the family unit and place them in out-of-home living situations. This can result in fear and confusion, which may lead to substance use disorders. At least three out of four foster care homes have problems with substance abuse by foster youth, according to the Center for Applied Research Solutions. Children in foster care also tend to have higher rates of illegal drug use than youth who have never been in foster care; 34 percent of foster care children struggle with illicit drug use compared with 22 percent of non-foster care children. Thomas said the Children’s Home Society of Florida often encounters cases in which children abuse substances. She added that children in foster care start using drugs and alcohol as early as 13 years of age and the drug use becomes more frequent in their teenage years, emphasizing that some of the children turn to substances to help them cope or avoid the pain associated with their broken families. Negative experiences such as trauma, maltreatment, mental illness and early exposure to parental substance use may increase the likelihood of substance use among teenagers. A 2012 study by the Pacific Institute for Research Evaluation revealed that foster care youth tend to engage in substance use a year and a half before their peers. Children need stability in their lives. Foster care youth often change schools and live with several different families. This lack of permanence takes a toll on their emotional, mental and physical health, which may push them to adopt negative behaviors. Some foster care children fall behind in school by three to six months every time they transfer to a new school, according to the California Foster Youth Education Task Force. They cannot connect to their teachers and have difficulty maintaining lasting friendships. These factors contribute to poor performance at school, so the children are then transferred to continuation schools, or other alternatives for at-risk students, where the incidence of substance use is high. What Happens to Children After Exiting Foster Care? 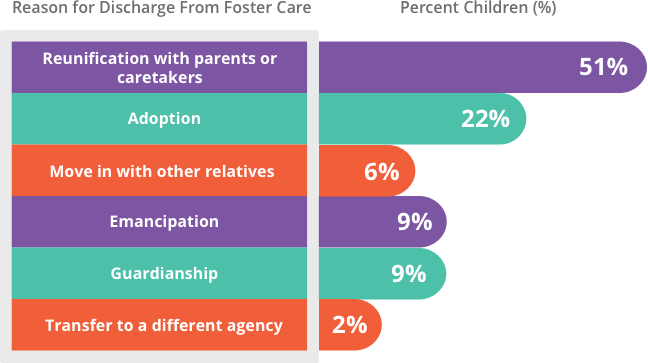 Slightly more than half of foster care children are reunited with their families, while the rest are either adopted or age out of the system. Children who exit the foster care system tend to experience worse outcomes than non-foster care children of the same age group. Among former foster care youth, less than 3 percent will earn a college degree, and more than 70 percent of women will be pregnant by age 21, according to data from the Jim Casey Youth Opportunities Initiative. One in four foster care children becomes homeless within four years of exiting foster care, and in 2012, only 48 percent of male former foster children obtained jobs. Children who exit the foster care system are also five times more likely to develop post-traumatic stress disorder. Life in foster care can be tumultuous. Former foster youth are seven times more likely than their non-foster counterparts to be dependent on drugs and twice as likely to develop alcohol dependence. Only one in four foster kids enters college by the age of 19, compared with 41 percent of the general population. Drugs and alcohol break families and prevent them from healing. Because of the low success rates of traditional family reunification programs, family drug courts were set in place to tackle substance abuse with the intent to bring children back to their parents. 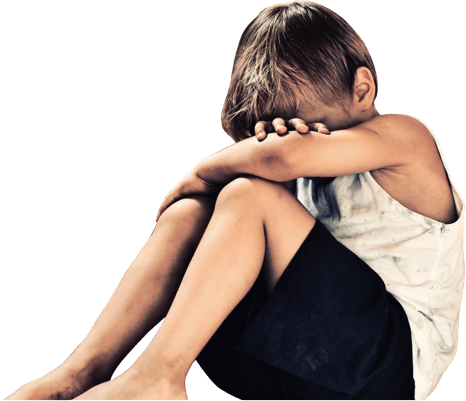 According to research published by the National Association of Drug Court Professionals, substances of abuse are involved in up to 80 percent of child abuse and neglect cases. The longer the parents struggle with addiction, the longer their children remain in out-of-home settings. But family drug courts have proved effective for substance-using parents. These parents are more likely to engage in treatment and follow through. The National Association of Drug Court Professionals report showed that family drug court (FDC) participants had 20 percent to 30 percent higher treatment completion rates than non-FDC participants. Similarly, FDCs contributed to higher family reunification rates than non-FDC programs. Children whose parents were in FDC programs have also spent less time in foster care than those whose parents were in non-FDC programs. In fact, parents who stuck to treatment were five times more likely to get their children back, according to the report. Theresa Trigg was one of those parents. One night, she rushed to her 20-year-old daughter’s house to find social workers getting ready to take away her two-year-old. Theresa had no fixed home and a substance use disorder. Her youngest child was going to foster care. But Theresa did not despair. The following morning, she was at a children’s court, working with a caseworker so she could bring her daughter home. For that, she would have to focus on long-term sobriety and prove that she could be a good parent. Leaving the courthouse on her own would mean running back to drugs. So instead, she ended up at the Milwaukee County Mental Health Complex, where they designed a recovery plan for her. From there, she went through detoxification and spent three months in a residential treatment program. Over time, Theresa progressed from supervised visits to unsupervised visits to overnight stays. Finally, she was ready to bring her daughter home. A year later, she graduated from the family drug court and was working toward an associate’s degree. Thomas explained that the goal of the child welfare system is to ensure that children have healthy relationships with their parents. 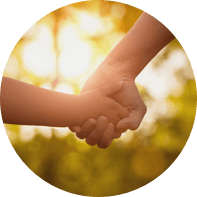 The Children’s Home Society of Florida helps children develop healthy responses to trauma and works with them to control their behaviors and substance use. Many parents start substance abuse treatment but do not complete it. According to the Adoption and Safe Families Act, if a child has been in foster care for 15 out of 22 consecutive months, child welfare services may file a petition for termination of parental rights. However, this timeframe may not be feasible given the duration of drug and alcohol treatment. There may be a waiting list for the treatment facility, and rehab may take months, which could make it more difficult for parents to get their children back. “We focus a lot on prevention, and we focus on helping the child and the parent together. We work on the parents and seek to support them so they can then support their children,” said Thomas. She added that drug courts are paramount in helping parents recover from substance abuse. In fact, the Children’s Bureau stated that drug courts were associated with high rates of treatment enrollment, treatment completion and family reunification. Thomas stressed that parents are a critical part of their children’s lives and that it is important for health care providers to work with children and parents together. Child welfare workers also need to work with mental health professionals to continually assess the behaviors of children and make sure they have the services and guidance required to lead healthy lives. Children in the child welfare system should be reviewed on a case-by-case basis, and therapists should address trauma symptoms and teach these children healthy coping skills to avoid a potential substance use disorder. Parents have a better chance at being reunited with their children when they focus on recovery. More than half of children entering foster care are reunited with their parents, according to the 2015 AFCARS report. A 2009 study published in the Journal of Substance Abuse Treatment found a correlation between successful treatment completion and reunification of children with their mothers. The study cited child welfare data from Oregon that revealed three links to a successful reunification between mothers and their children. The mothers who met these criteria were more likely to be reunited with their children than those who did not engage in treatment. The study also found that mothers who were involved in professional, educational and family services had a better chance of reunification. Parents in residential substance abuse treatment programs may face several challenges, including having to place their children in foster care while they recover. However, receiving addiction treatment does not mean a stop to parental responsibilities. Mothers and fathers risk losing parental rights if they fail to keep in contact with their child and the child has been in foster care for an entire year or 15 out of the last 22 months. 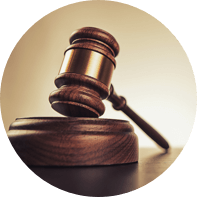 Individuals whose children are in foster care should maintain constant communication with their children and collect evidence of their efforts to present to the judge. 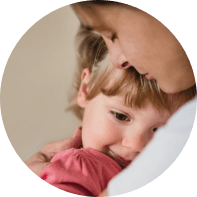 Efforts to remain involved in their child’s life include arranging care while the parents receive treatment and updating caseworkers and attorneys of their status. Parents are also required to complete family service plan programs and attend family court proceedings. “I graduated from a year-long inpatient treatment program, started working full-time and doing all the services that the court had ordered. I was able to work down the list of required services [and] I went from non-compliant to partially compliant to compliant. Today […] my daughter and I are together,” Shrounda Selivanoff, said in a testimony published in the Children’s Bureau Factsheet. So many parents are held tightly in the grip of an addiction that prevents them from caring for their children. But with the appropriate treatment and recovery plan, mothers and fathers can get their children out of foster care and become the parents their children deserve.